The First Minister has made the emotional plea in an open letter in which she assures EU citizens that Scotland “is your home”. 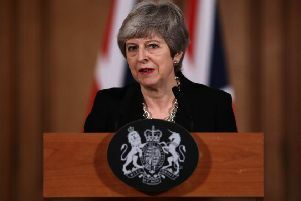 The ‘Stay in Scotland’ campaign has been launched as Prime Minister Theresa May this morning asked EU leaders for a further Brexit extension until 30 June. About 223,000 EU citizens live in Scotland. An estimated 13,000 of those are working in the NHS. Ms Sturgeon’s letter has revealed she has found dealing with the plight of EU citizens living in Scotland as the most difficult part of Brexit. The campaign will be officially launched today in Glasgow. Research published by the Scottish Government has shown the average EU citizen in Scotland adds £10,400 to Government revenue and an extra £34,400 to gross domestic product every year. Ms Sturgeon said: “The closer we move towards the UK’s exit from the European Union, the more real and substantial reassurances about your rights and position in this country you need. It has been suggested the UK Government’s immigration plans for post-Brexit could slash workers in Scotland by up to 5 per cent in the next two decades.